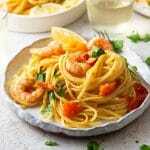 A 20-minute Shrimp Linguine made with cherry tomatoes, white wine, garlic, chili, and parsley. This simple Italian pasta dish is fresh, delicious and super easy to make. Serve with lemon wedges and a nice cold glass of vino. Cook the linguine acording to packet instructions until al dente making sure to reserve 1/2 cup (125ml) pasta water before draining. Meanwhile, heat the olive oil in a large pan and add the garlic, shallots and fresh chili. Sauté for 1-2 minutes until soft and translucent but not browned. Next, add the sliced cherry tomatoes and cook down for around 5 minutes until they start to soften and become saucy. Add the white wine and let it reduce by half, it should still be saucy, see photo 4. Add the raw shrimp and cook, stirring occasionally until they turn pink. Once pink add a splash of pasta water (around 1/4 cup/60ml). Add the cooked linguine and toss in the sauce, sprinkle over some freshly chopped parsley and serve with fresh lemon wedges. I love to use different coloured cherry tomatoes especially when they are in season but you can use any. Just make sure to use cherry or grape tomatoes for the sweetness. You could also use spaghetti instead of linguine but I wouldn't recommend using any short pasta shape. Use a dry white wine for the sauce, it doesn't have to be Italian or expensive but it should be something you'd happily drink and definitely don't use cooking wine. Use fresh raw shrimp if possible. I used half a fresh red chilli but the heat of the chili will depend on the type and size you use, all chillies are different so add just the right amount for you or don't use it at all. You could also use red pepper flakes instead of fresh chilli. Serve the pasta straight away as leftovers won't keep well. Serve with chopped fresh parsley and don't sub it for dried. As much as I love this shrimp linguine as it is with its freshness you could also add a dash of cream into the tomato sauce after you have reduced the wine. Don't add much, you don't want to taste the cream it should just give it a delicious creamy texture and make sure to cook it down for around 2-3 minutes. You might need to reduce the amount of pasta water added to just 2 tbsp or omit it altogether. The sauce should coat the pasta perfectly and not be swimming on your plate. You could also give the pasta a creamy texture without cream and by adding a knob of butter in at the end. It'll coat the pasta and melt into the sauce giving it a creamier and richer taste.